Coin Flip Chain Energy is burn's friend. Not every burn. Curse of Darkness and Chain Energy both wouldn't work in a deck like, say, a Spatial Collapse deck. What they can play, they will reserve until it is gamebreaking. See Ojama Trio for an example. Curse of Darkness and Chain Energy (as well as their cousins Chain Burst and Toll) cause a payment method. I used the comparison yesterday of "[putting] your foot on Burn's accelerator". That is a very fitting statement, particularly for Chain Energy. Burn doesn't get hurt by this. Burn usually plays down everything they need and THEN plops this down. When what burn plays consists of stuff that operates on the field and creates continuous as opposed to one-time burn (such as Stealth Bird or Lava Golem or, well, this), Burn is placed at a small disadvantage while the opponent whittles away 6.375% of their life for every card. That's not much, but throw in a Curse of Darkness and they're losing 19.125% of their life for every magic card they play. Then it's just a matter of waiting. Use a Giant Germ, summon two more out of your deck (thus not taking damage for this) and then they're down another 500 to 2000. That just keeps on whittling and whittling... It's like preparing a carrot for soup. Peel the carrot's skin off, wash it, and then dice it into pieces of varying sizes. Okay, weird comparison. So sue me. I actually wonder how well a bounce deck incorporating Chain Energy would work. Use Compulsory Evacuation Device or something and continually keep your opponent's cards off the field while attacking with stuff like Hyper Hammerhead that will hurt them again for summoning. I'm sure Tranorix will mention it. Hell, don't even listen to the other reviewers. Tranorix has experience with Burn that I don't think any of us can parallel. Anyway, you get general burn and bounce ratings. Now THIS thing is a bit more viable in a Burn/Stall. If you can set a Magic Jammer or some other anti-Magic card, some other stall cards, then play Chain Energy, your opponent will have to watch their life very carefully. Just think of this card in multiples. It's just sick and wrong. This, combined with the attack-blockers (MoP/G-Bind/LLAB) are the reason people end up siding up to the maximum on Dust Tornadoes and Mobii (Mobiuses). Enjoy the rentsy recycled review! As Burn Week progresses we get to some of the older forms of Burn, Chain Energy. 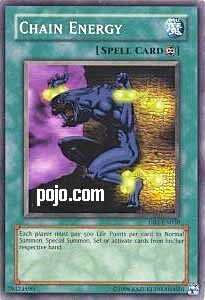 Chain Energy is probably one of the most difficult to use yet the most effective Burn Card in existence, due mainly to its frequently activating effect. While Chain Energy is on the field each player must pay 500 Life Points to summon, Set, or activate a card from their hand. This is another one of those cards that I have seen very little of, but I can see its potential. Most players play at least 3 cards from their hand each turn; a monster, a Spell or two, and maybe Set a Trap. Assuming they keep up this routine while Chain Energy is active they could easily be dead in a few turns. Much like yesterday’s card Chain Energy works both ways, causing the controller of Chain Energy to potentially fall prey to their own card. This is why a person who uses Chain Energy must be sure to have all the cards they may need on the field prior to its activation. If this is done there is no reason as to why they can’t seal the duel with little difficulty. Some monster removal, Spell negation, and maybe a few Burn cards are all that Chain Energy needs to be truly successful. Other than Chain Energy’s required planning, Chain Energy has only one flaw; S/T destruction. Of course all Continuous S/Ts have this problem, so Chain Energy shouldn’t be marked down for it. Because Chain Energy requires some planning to use, it’s best if reserved for its own Deck-Type as well as highly seasoned players. Advanced: 3/5. Use it properly and Chain Energy is a great deal more than 5. Traditional: 3/5. Use it properly and Chain Energy is a great deal more than 5. Art: 2.5/5. The picture really explains what Chain Energy does; it restrains each player from doing anything. It’s only fitting that we review a very powerful burn card on ‘Ash Wednesday’. And Chain Energy is just the one. With an effect that literally makes both players pay to activate any card, Chain Energy basically throws the game into a state wherein whichever player has the more cost efficient cards, or rather, how few cards they can use to achieve victory, will win. 2-3 cards followed by a Chain Energy. Assuming he has a counter to Heavy Storm or that you just didn’t draw Heavy, you now are looking at taking 500 per card just to play or set it, and that’s not counting the fact that your opponent probably has some stall to keep you from attacking. So, you’d be taking damage to summon monsters that won’t be able to do anything. Congratulations, you just wasted your summon, took 500 LP, and now must contemplate just how many times you can do this and still survive the duel. Ick. The fact that your opponent can play around the initial chain energy is also sick. The fact that multiples can stack is even “raunchier”. Don’t even bother to try and beat a first turn double chain energy if you didn’t draw Heavy Storm or Giant Trunade, because winning is practically out of the question, unless you set Fiber Jar (which may work here but is in general a terrible card to play against burn because it allowed them to reuse their burn spells and fill up their arsenal to incinerate you). Actually, I can’t really think of any good counter-measures to prevent getting owned by Chain Energy besides the aforementioned cards. This card will make your opponent (and you) pay for every move, and will force you both to choose wisely which cards take priority in being played over others, because, without significant life gain or m/t removal, you won’t be able to use them all. The difference between Chain Energy and other variants like yesterday’s Curse of Darkness lies in the fact that Chain Energy still makes you pay for using all forms of removal, whether via spell, trap, or monster effects. This versatile and global effect will hamper even the most precise approaches to spell and trap removal, which as I have said before, if the key to beating burn. So, if you come across a burn deck running Chain Energy in threes, just be sure to set all your important things ASAP – don’t be afraid to switch your game up a little bit if it means playing around Chain Energy, especially when given the chance to Dust Tornado something end phase, and even use the secondary effect to set another card from your hand. Get creative, prioritize your cards and most of all, wait for that mass removal to start going after your opponent. Good luck that, because Chain Energy is one beast of a card. The fact it forces you to mathematically play the game in your head to try and figure out if you can beat the opponent by playing all your spells or not is already a daunting one. The fact you can’t ever be sure about what tricks your opponent has up his sleeve is even worse. Traditional – 1.5/5 Cards here are more efficient; there is less card parity, not to mention Duster is just one more worry for this card. Advanced – 3/5 I’d say it’s exactly twice as good in advanced format, especially given the preponderance of [successful] burn decks out there and fewer blatantly advantageous cards. But now we are in the advanced format...where 1 Mystical Space Typhoon and 1 Heavy Storm are there...with 3 Dust Tornado, Breaker, Swarm of Locust, etc...but that's not the point! Chain Energy is only 500 damage per a card set or played onto the field...doesn't seem like much at all (but then secret barrel seems like nothing also). Is it like yesterday's card? Only nutty on the first draw? doesn't help that much in the later games? Chain Energy seems to me it'll do a lot of damage in a game...around 2000+...That to me is a very good statistic and would make me want to run it. Stats : Chain Energy is a Continuous Spell card. As it places an effect on the field that hits both players equally, this is probably for the best: as a Trap it might have surprise value, but ultimately would suffer from being vulnerable to much negation. If it placed an effect on the field similar to Final Destiny, then you’d have no way to rid yourself of it. I suppose it could have made an interesting Monster, but again, the possible benefits would be out weighted by the card becoming more cumbersome to get into play. Abilities : Chain Energy essentially adds a 500 Life Point “Cost to play” to each card. This means that it won’t keep both players from playing any cards at all, but it will make them watch how many. To clarify, when I say play I mean either activating from the hand or Setting the card. Cards summoned via the effect of Cyber Jar, for example, would not trigger a cost, and that is straight from the official FAQ. Also note that the cards stack. When you have two or more out, the game will grind to a near halt. Very potent ability. Combinations : This card can be added to any deck that has room, and have a potential to help. Note that it boils down to luck for it to help: getting it out when you need to play less cards than your opponent, and the difference proves lethal to said opponent. As stated, that’s practically a coin flip if both players are on more or less even footing. As such, the card works best in Stall/Burn decks. Basic use of the card (in my experience) is to try and get two copies out at once. Set one, then play the second one, then activate the first. Unless you opponent managed to chain at the right time or has everything they need for the rest of the game in play, they suffer a minimum of 1000 LP of damage. Usually, once you set up as described, it will be a good 3000 LP burn. Now, there are ways to handle this card affecting you. First, try playing stuff that has effects that would allow you to get cards into play other than from your hand. Another good choice would be bounce cards. Bounce your Chain Energy to hand so you can safely play more cards, and then replay the Chain Energy. Giant Trunade seems especially suited for this. Although it leaves you low on space, if you can set a Giant Trunade along with the Chain Energy, a 2-4 card combo ends up eating a good chunk of your opponent’s Life Points. Bouncing your opponent’s cards, of course, will lead them to have to sacrifice LP to maintain any sort of advantage (other than a false “hand” advantage; what good are cards in hand when they can’t be played). Traditional : 2.5/5-The abundance of Spell/Trap removal makes using this card very difficult. You also have to worry about hand disruption, so making sure two come out at once is difficult. Advanced : 3.75/5-This is one of my favorite Burn cards in the game. It’s not quite as effective as some others, as it really needs to be out in multiples for a huge difference. Limited : 4/5-Even as a single, it seems useful here. It’s doubtful that most of your opponents can get rid of it (unless Starter decks were used along with a few packs). As such, you just need some decent big monsters, and then you can slap this down so that they can’t just try and hide behind sets to stall for their own power cards. One of the most dread burn cards in the game… at least if you know what it can do. After all, most others are one and done or trigger only to a restricted class. This just keeps zapping them anytime they play anything.